Art Blakey, whose career has spanned close to 50 years of black music history, exemplifies the timeless role of the drum in jazz. He mentions Chick Webb and Sid Catlett, the master drummer-orchestrators of the black dance bands of the 1930s, as primary influences of his youth: Webb for bringing the drums to the forefront of the ensemble as an instrument of equal value within the ensemble; Catlett for his use of dynamics, and for his finesse and technique. Blakey has been a working musician since his early teens. In the 1940s, he was employed in the hard-swinging dance bands of Lucky Millinder, Andy Kirk, Jimmy Lunceford, Earl Hines and Billy Eckstine, and backed Charlie Parker and Thelonious Monk, among others, in smaller units. Blakey's fame stems from the various groups he has led since 1947 under the Jazz Messengers name. Those buying this album know the range and quality of personnel he has used, and are familiar with the amalgam of back-beats, shuffle rythms, press rolls, hi-hat touch and individual tuning that have made his sound immediately identifiable, synomous with the sound of his bands. This edition of the Jazz Messengers reminds me Blakey's virtuoso units of the early 1960s. Trumpeter Wynton Marsalis, barely 20 years old, evokes the role played by Lee Morgan and Freddie Hubbard. 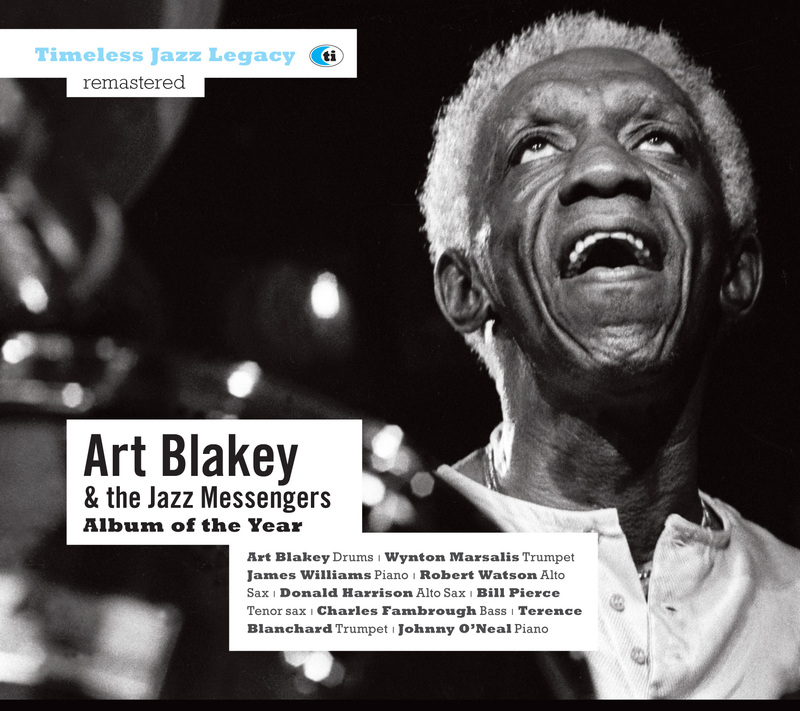 His substantial, clean sound adds brilliance to ensemble passages and (as evidenced in the powerhouse "In Case You Missed It"), he has the technical facility to gobble up the changes at any tempo Blakey can muster. His concise solo on Charlie Parker's "Cheryl" shows a keen awareness of form. structure and dynamics. Saxophonists Robert Watson and Bill Pierce fit hand in glove with the demands of Blakey sound. We hear the Southwest lope in Kansas City-born altoman Watson's phrasing, and he projects the hard-edged tone we identify with Charlie Parker and his stylistic ancestor, Professor Buster Smith. Pierce, schooled at Berklee School of Music and a teacher in Boston, has impeccable chops, and has absorbed Û from the evidence on this album Û tenor saxophone approaches from Dexter Gordon to Wayne Shorter to Coltrane, while never sounding derivative of his sources.The rhythm section gives the front line strong and subtle support. They are never caught unawares by Blakey's sudden shifts of tempo and dynamic nuance; the time is always right on; the solos appropriate. Pianist Williams, Memphis-born, is steeped in the music of the black church and knows his blues, as we see on his original "Soulful Mister Timmons". Bassist Fambrough, fresh from several years wit McCoy Tyner, is a rhythmic rock, fat-toned, technically facile, as shown in the four-bar exchanges at the end of "Cheryl" and the solo passages on his original "Little Man", a sprightly rumba-type theme that resolves to a 4/4 blues beat during the solos. Blakey again has found superior young talent, and refined and polished their skills by providing constant work in a variety of situations. It is appropriate that the album's second tune, "Ms. B.C. (by Watson's wife Pamela), is a dedication to jazz singer Betty Carter, who has also taken upon herself the mission of passing down values and musical knowledge to her young collaborators. The road is indeed the true finishing school for the jazz musician, and this album is the culmination of nine months of steady work on one-nighters and week-long stands, primarily on European tours for Timeless' producer Wim Wigt. The fruits of Blakey's work are apparent on this album: it is truly an ALBUM OF THE YEAR.